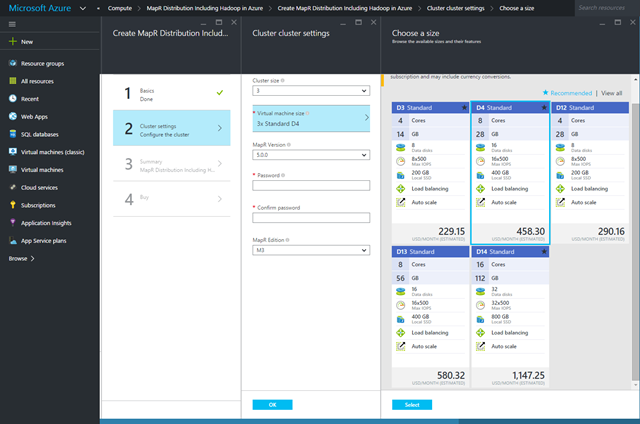 We are excited to announce MapR cluster deployment availability on Azure Marketplace. 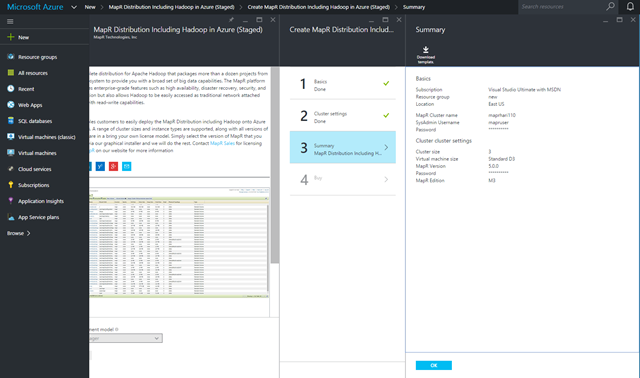 Using the streamlined Marketplace UI one can easily setup 3, 6, 10, 20, or 30 node size MapR cluster ready to handle any enterprise class workloads. 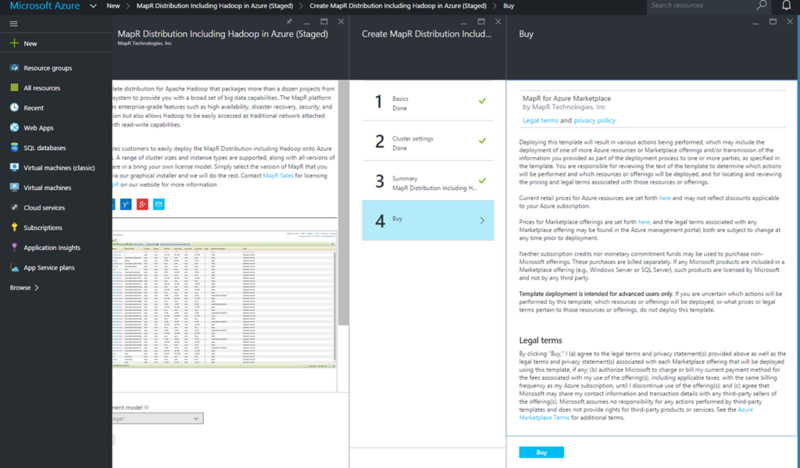 In this blog post, we will walk you through the steps required to deploy this cluster. MapR is a complete distribution for Apache Hadoop that packages more than a dozen projects from the Hadoop ecosystem to provide you with a broad set of big data capabilities. The MapR platform not only provides enterprise-grade features such as high availability, disaster recovery, security, and full data protection but also allows Hadoop to be easily accessed as traditional network attached storage (NAS) with read-write capabilities. 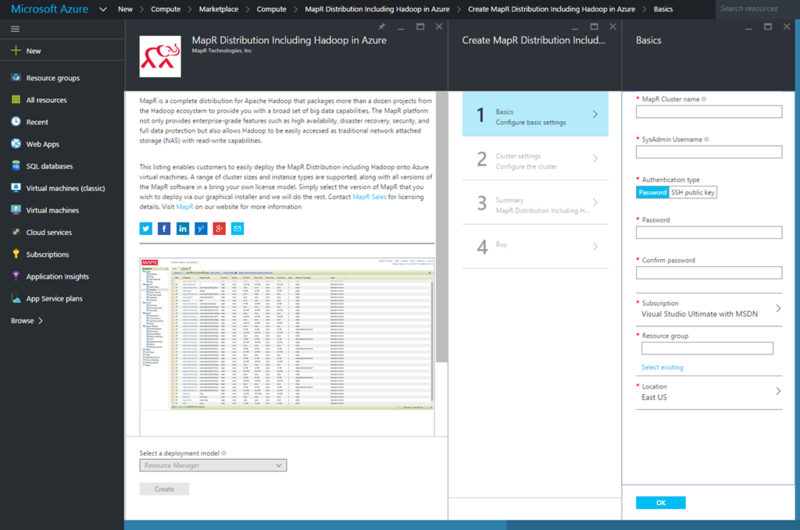 You can find the MapR offering in the Azure Marketplace by navigating to Marketplace in the Azure portal, and searching for MapR. Once you have selected the offer please go through the create process and enter the Basics configuration for the cluster deployment which includes: MapR Cluster name, SysAdmin username, authentication type (you can choose password or SSH public key), resource group name, subscription and location where you want to run your MapR cluster. In the cluster settings section you get to choose the size of the cluster (3, 6, 10, 20, 30) on various D size virtual machines. Based on the workload requirement you can choose the processing power you require. Please note, based on your selection you might require a quota increase, read more about it here. You can also choose the MapR version you require, or choose the latest as the default. For management of the MapR cluster through the MapR webportal, you would also need to provide the management password. Finally, you also get to select the different MapR editions, M3 being the community edition. More details regarding MapR editions can be found here. Marketplace will provide a summary once completed and at this point you can also download the ARM template that would be utilized to provision the MapR cluster. 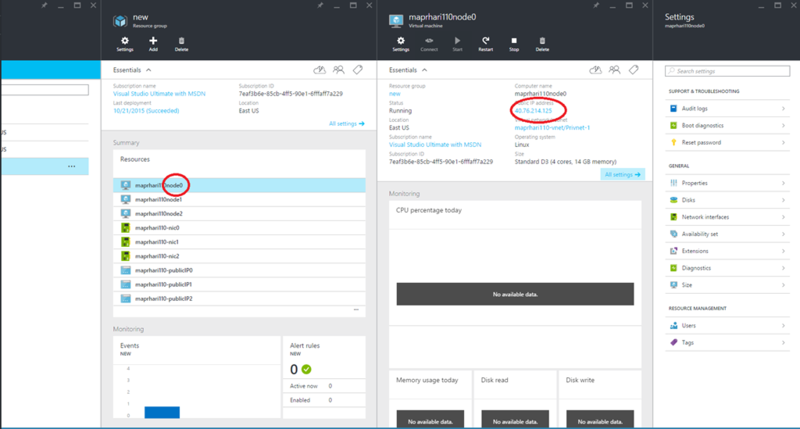 This can help customers who would want to continue launching MapR clusters via Azure CLI/PowerShell. Once your cluster is setup, you can log on to the MapR web console. To connect simply get the IP address of node0 of your cluster and connect via https://<node0 IP>:8443. Once connected, you will be able to see the MapR console (the user to connect to the console is MapR and password is what was configured for MapR admin in the cluster settings page). In case you hit a problem provisioning the cluster, you can get detailed help by looking at the resource group you created. Your deployment requires more resources than your current quota. You can request additional quota increases. Find more detail here. Deployment succeeded, however, I cannot connect to MapR Console. Find help for MapR here. Not ready to fully deploy MapR cluster? Try Azure Fast Start for MapR here.